Who doesn’t love a banana loaf! 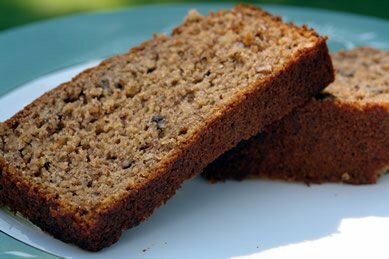 A hearty loaf that can convert even the most suspicious of eaters into gluten free banana bread lovers. Tip: when you see ripe bananas on sale in the store, buy and peel and freeze them for later use! Stir together bananas and baking soda in a bowl and set aside. In a separate bowl, cream sugar and margarine together. Add eggs one at a time until blended. Stir in mashed bananas. In a separate bowl, mix together flour, baking powder and salt. Add to banana mixture and stir to moisten. Add walnuts if desired. Pour into 9 x 5 inch greased loaf pan. Bake at 350F for 55-60 minutes or until toothpick comes out clean and dry (If using a smaller pan, you will not need to cook as long). Will have to try this one too. Thanks for sharing Zahra and Sylvia!